Once feedback is received on the suggested enhancements, a formal recommendation will be presented to Edmonton City Council in the fall. Existing stairs and ramps replaced with new grade-level lobby including control, services and seating areas. The new 'glass box' would feature day-lighting and views. Re-using outdated racquet courts on two levels to create new family change, locker room expansions, on-deck steam / sauna rooms, 6 additional multi-purpose and meeting rooms, and a doubling of the fitness centre to 15,000 square feet. Outside behind the dive tower, the 2-storey addition would feature a dry-land training centre on a second level and storage and park washrooms on the main level. 4 new convertible international squash courts would be built beside the existing non-conforming courts. Movable demising walls would allow for use as 2 large additional multi-purpose spaces. Fixed seating on the concourse level (south side of the main pool) would be removed, a platform built and a series of office spaces added. On the partial 3rd floor, offices and meeting rooms would be added. 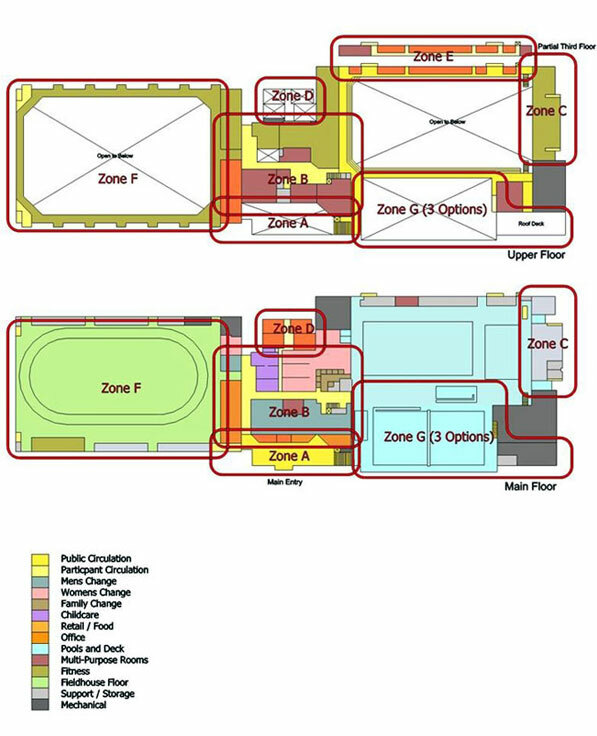 Improvements to the fieldhouse would include new sport floor and upgrade of the upper running track. Further improvement to storage and conversions. Option 1: New deeper warm-up tank (same footprint) featuring a new bulkhead and partial movable floor. New accessible 25-person hot tub on deck added. Option 2: Warm-up tank, wall and roof are removed and replaced with a new structure housing a 52m X 25m deep tank with bulkhead, ramp, and partial movable floor, plus added storage. Hot tub added on existing deck. Option 3: New structure and tank as in Option 2, except wider to accommodate retractable on-deck spectator seating. Hot tub added on existing deck.